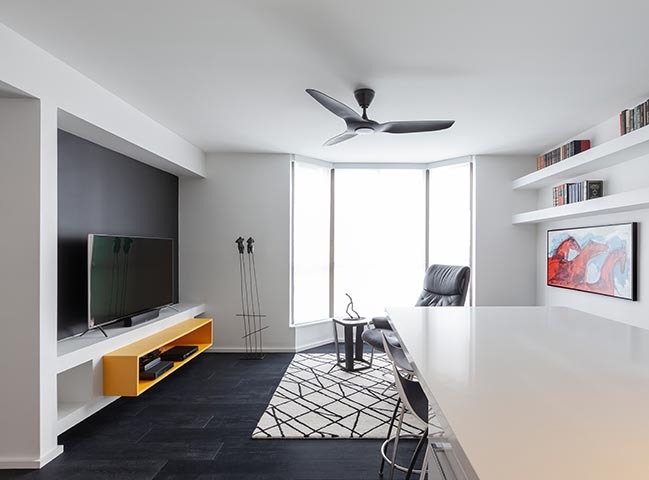 Atelier RZLBD transforms the typical Torontonian condominium unit into an architectural space where the residents’ lifestyle is truly appreciated. From the architect: In the history of psychology, there was once a psychosurgical treatment called lobotomy, in which a hole was made in the skull near the frontal lobe, believed to cure mental disorders. 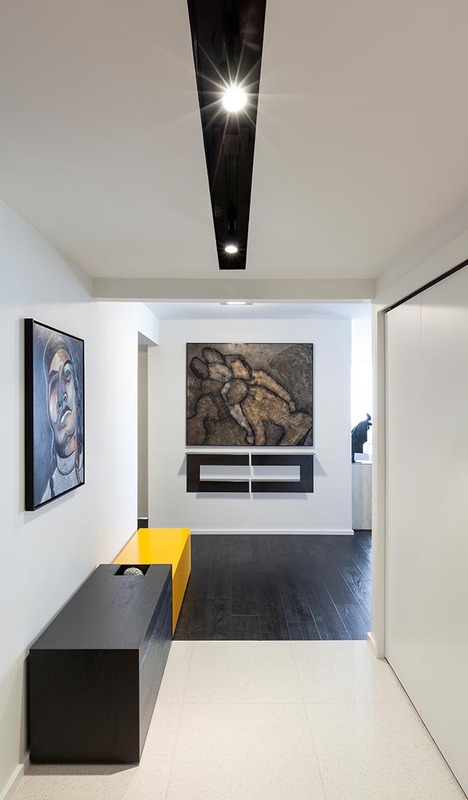 For the Atelier RZLBD, a series of its interior renovations for condominium units in Toronto have just been like this surgery, in which it has attempted to create an architecturally integrated space without touching the exterior and permanent elements. In these projects, what was once very generic, overly defined programmatically, and cluttered spatially was given a clear spatial order, latent in the existing floor plan, and simplicity that conforms to the resident’s specific lifestyle. These have been termed “architectural interventions,” in which the outcomes stand in-between interior design and architecture. DOHA, like its predecessors, transforms the typical Torontonian condominium unit into an architectural space where the residents’ lifestyle is truly appreciated. 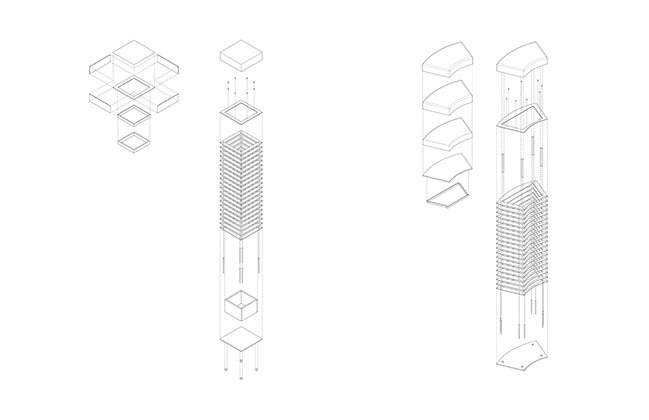 Originally, the rooms were arranged inefficiently without a clear spatial order. Programs were “stuffed in” generically, which resulted in doors that collided, passages that looped around the cabinets, walls that broke movements and made rooms feel smaller. 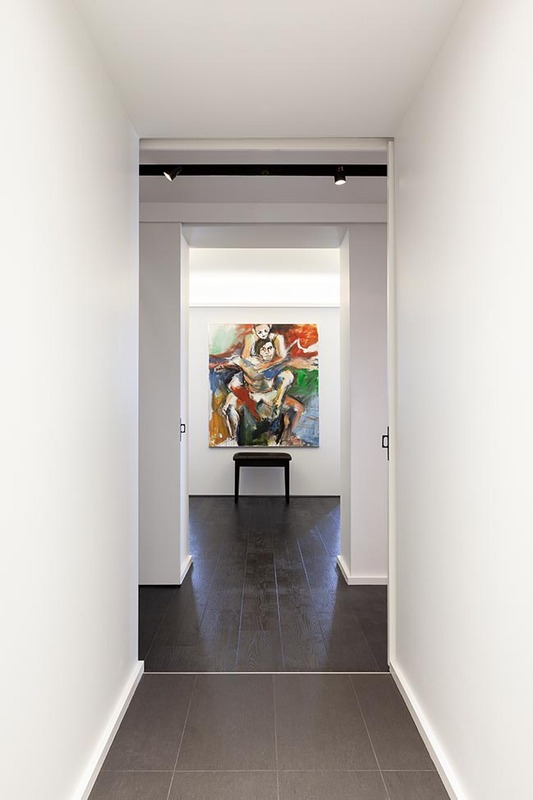 To “cure” this space, the atelier first demolishes all the removable pieces and establishes an order inherent in the old plan, which is the straight, double-loaded hallway that runs from one end of the unit to the other. 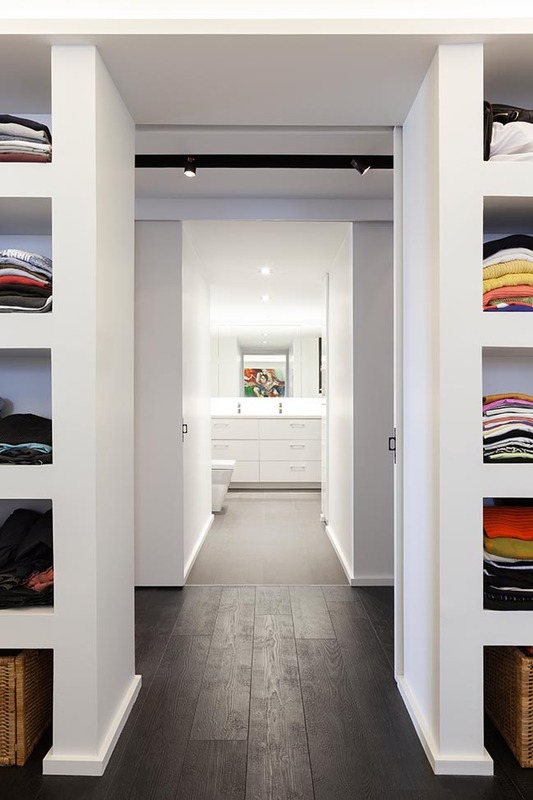 All the rooms are realigned based on this central passage and the unremovable parts of the unit, such as kitchen and washrooms. 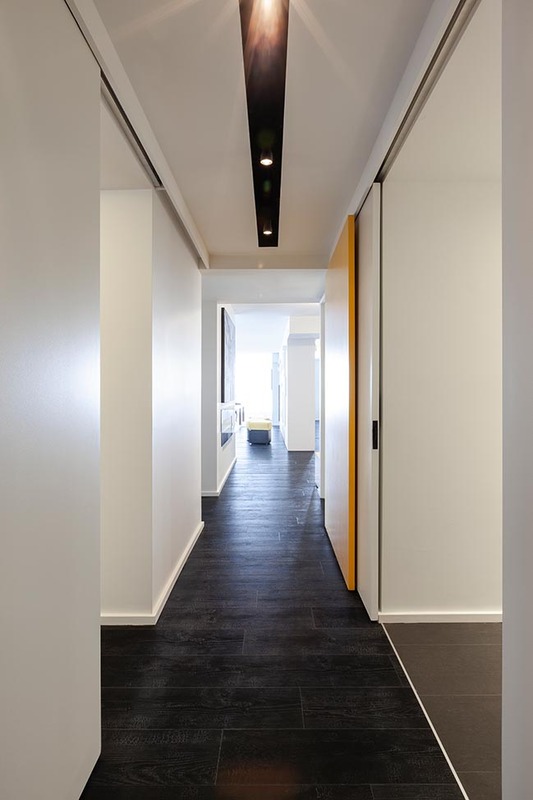 This radical linearity not only unveils the clear sightline that allows one to perceive the entire spatiality of the unit, but also offers an imaginative dimension to the space; with a window on one end and the wall painted black on the other, the horizon line of the hallway is obscured by brightness and darkness respectively, creating a greater sense of depth and transitional atmospheres in entering public and private realms. 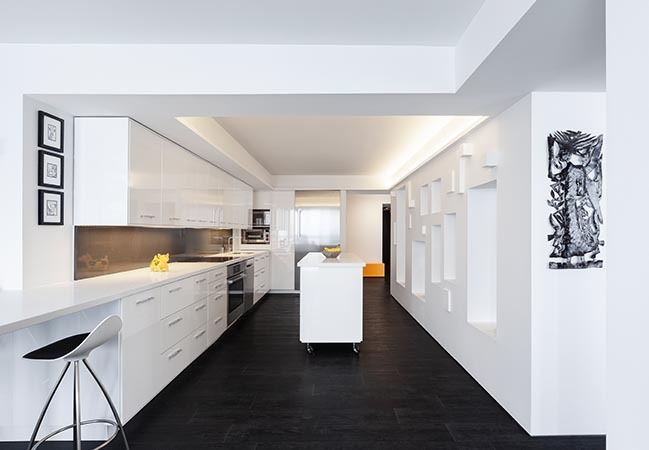 Other design elements are also enforcing this long axis — examples are linear ceiling track lights accentuating it and sliding doors keeping it uninterrupted with an animated view at all time. In the previously disordered space where the residents lived for over 30 years, objects had also piled up due to the lack of storage. 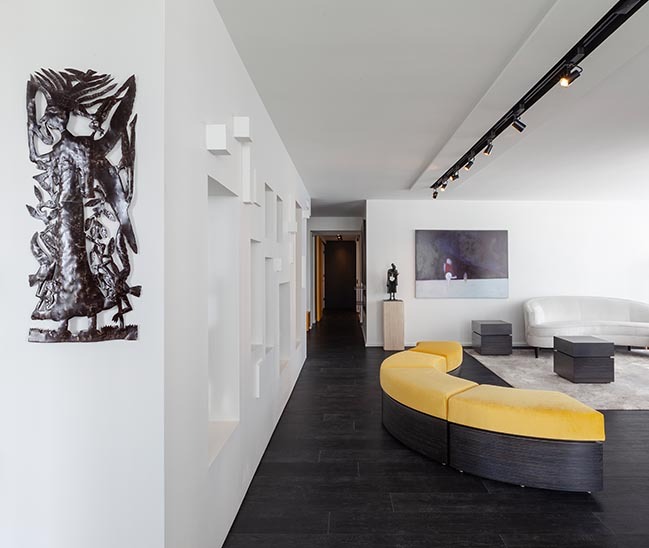 In designing the new space, the atelier integrates the immense art collections owned by the residents with architectural elements and furniture, to give them absolute positions in the house and to reflect the residents’ lifestyle even in details. 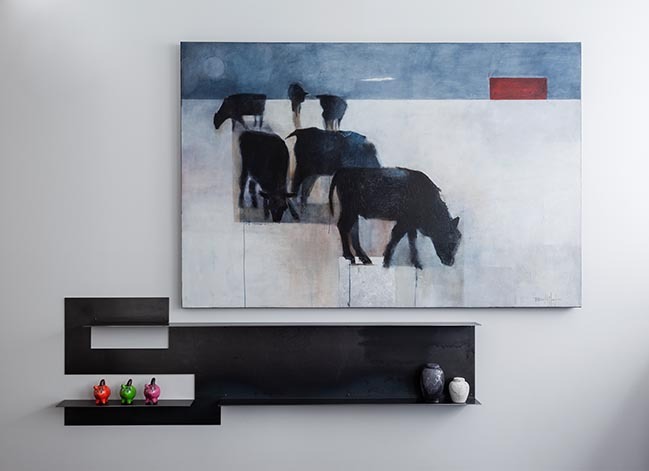 The partition wall between the kitchen and the living room, for example, contains multiple large and small openings dedicated to sculptures as their display niches. Through these voids, the kitchen and the living room are visually connected, giving the artworks both the ornamental and architectural roles. 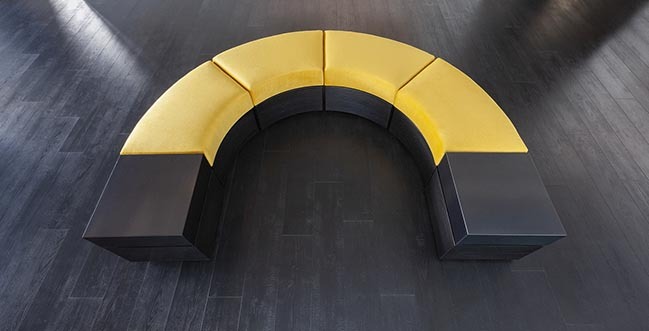 In front of the feature wall is the concentric modular bench, specifically designed for the unit, the various configurations of which complement the linearity of the gallery space and serve for many types of entertainment. 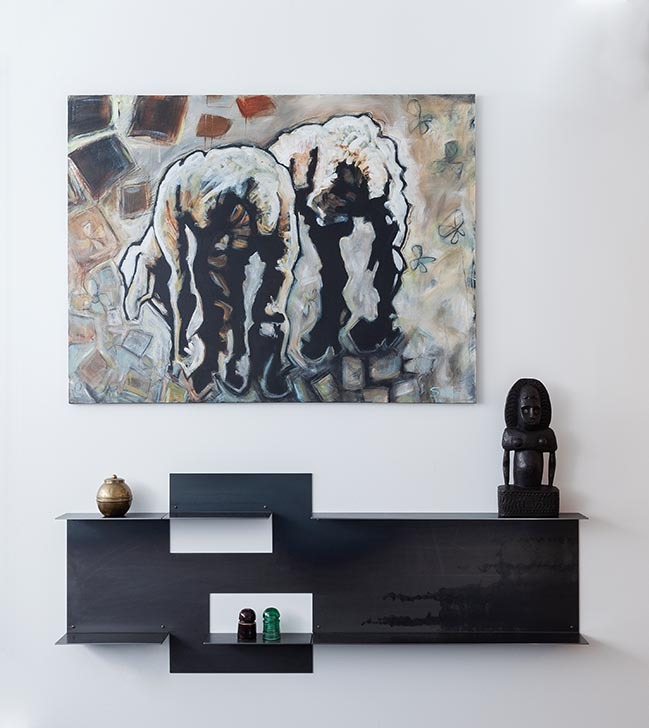 Smaller furniture such as the consoles and the bench at the entry foyer is also designed and fabricated by the atelier, the dimensions of which are determined by the paintings hung over them, making each pair irreplaceable. 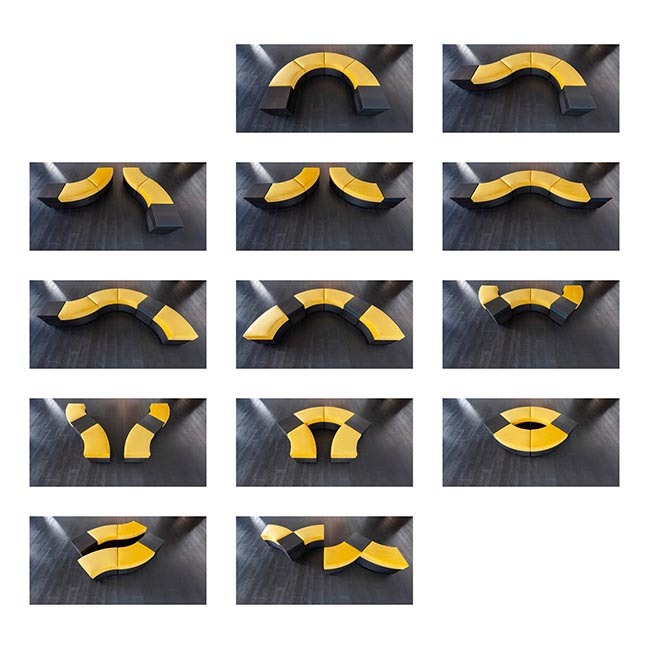 Even the canary yellow color repeated throughout the house is chosen by the residents themselves, thus symbolizing their distinct identities. In today’s urban environment where the developer-oriented mass-housings have become a norm, DOHA Nest pursues a world where individual’s residential needs and wants are respected as a right. To satisfy the diverse market, a house has become too articulate and generic, forcing the society to live in a singular lifestyle. 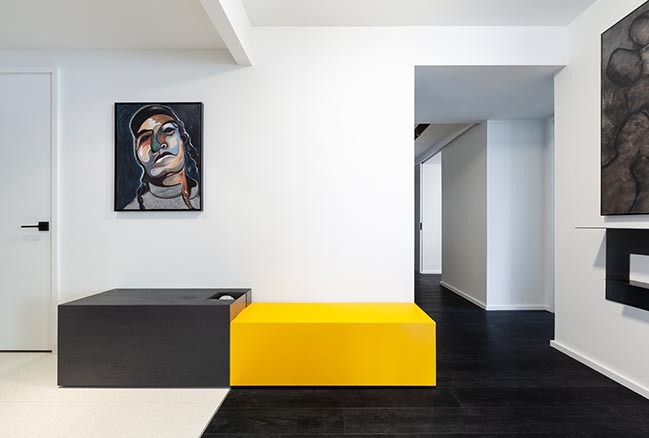 Performing a lobotomy in a condominium unit, the atelier hopes to initiate a meaningful discussion on the definition of a “home” being possible in the metropolitan society.